Some Days You Just Can’t. Home » Yoga Thoughts » Some Days You Just Can’t. 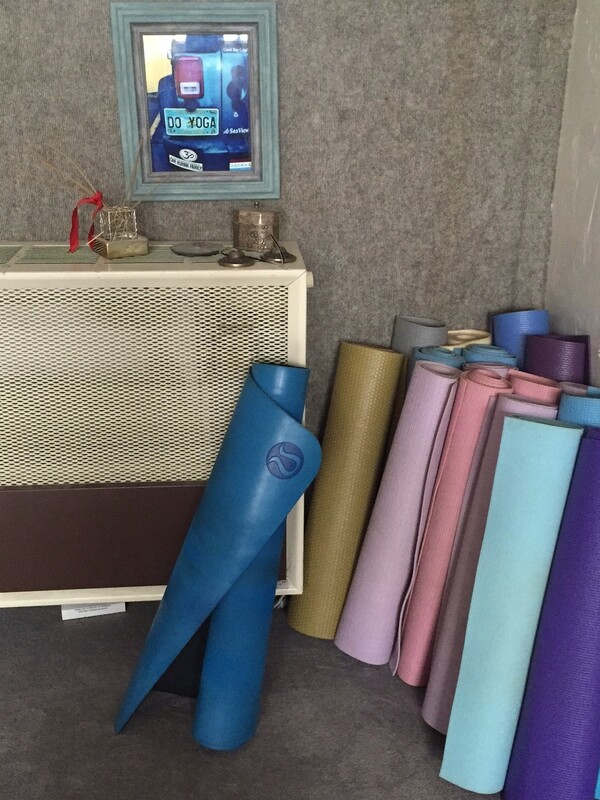 Though it feels a little like blasphemy, I’m going to go ahead and say it: There are days when it is simply not practical or possible to unroll our yoga mats to practice asana (postures). Before you start leaping about and cheering that I’m going to give you a free pass to skip your practice when you feel too busy, or too tired, or too lazy to get up an hour earlier than you really need to in order to get your practice in, read on. One day I was unable to practice because I spent a whole day in the city with my child while he had a medical procedure. Another day we had a full day of travel that began way too early to get up even earlier. I spent yet another yoga-free day at my son’s college orientation. And another at an all day crew regatta cheering on my daughter’s team. I’ve learned from these days that, while it’s almost always a better day when I practice, there are days when life is better because I don’t. Which is why I decided to leave my mat at home when we left for a family vacation in Iceland. This highly anticipated trip was a celebration of our son’s graduation from high school. Even more important (at least from my perspective), it was to be a chance for us to spend time together after a particularly hectic spring and before our son heads off to college. After some (OK, a lot of ) soul searching, I decided that to set my alarm to get up early and practice each day would hamper my ability to enjoy this extraordinary adventure and precious time with my family. I didn’t want to go to bed earlier than everyone else. I didn’t want to miss out on family breakfasts. I didn’t want to steal an hour or two away from the fun of each day. I didn’t want to be falling asleep in the car. I wanted to squeeze every moment out of this trip, to see every single sight, to say “yes” to every crazy idea my kids had while we were there, to be able leap into every activity with all of my energy and enthusiasm at the ready. And I did. It was the trip of a lifetime. According to many of his longtime students, but especially Tim Miller, who is quoted here, the founder of Ashtanga yoga (the kind of yoga I practice and teach), Sri K. Pattabhi Jois, “was very clear that one’s yoga practice is not meant to consume one’s life, but rather to support all the other facets of one’s life.” It can be easy to lose sight of this when you’re deeply invested in a practice that is designed to be done 6 days a week. It can be easy to lose sight of this when you’re hard at work on a particular posture. Or when you’re feeling great changes in your body. Or when you’re healing from an injury. Or … or … or. But it is critical that we remember these wise words. Yoga is simply not about “jumping around on a mat” (to quote my teacher, David Keil). Sure, all that jumping around is fun and feels good and creates strong, limber bodies that we love. But these are by-products of yoga. All that jumping around is designed to teach us to be still – inside and out. To be able to give our all to whatever life brings our way – one thing at a time. To be able to listen – to the stirrings of our own hearts, but also to those we share life with. To be able to get perspective on the events of our days. To be able to create space from the storms of thoughts and emotions that can otherwise overwhelm us. To better live as the people we want to be – honest, centered, caring, generous people. By choosing life over my practice for a week, I didn’t stop practicing yoga. I just shifted the focus of my practice to these greater goals. And it worked. I was able to stay in the moment throughout our trip – wholly enjoying whatever we were seeing or doing. I had the energy to keep up with my three teens and then some! (I climbed a couple of peaks that they sat out!) I gave my family my all for the week and they gave the same right back to me. Looking back, the same is true of the other practice-free days that I mentioned. To have tried to squeeze my practice into any of those days would have added stress, depleted my energy and stolen my attention from what is really important – the non-yoga parts of my life. On days like these, to sacrifice my practice isn’t actually a sacrifice at all. Indeed it is a choice I can readily make knowing that my steady, regular practice has given me the ability to better give of myself to the ones I love in times of stress or times of fun. Which, when I stop to think it through, is exactly why I’ve maintained my daily practice for all these years. Good for you! Ashtanga is demanding but you have proven that the mat will always be there and sometimes the practice has to pause.